Meet the Judgement 7 team. 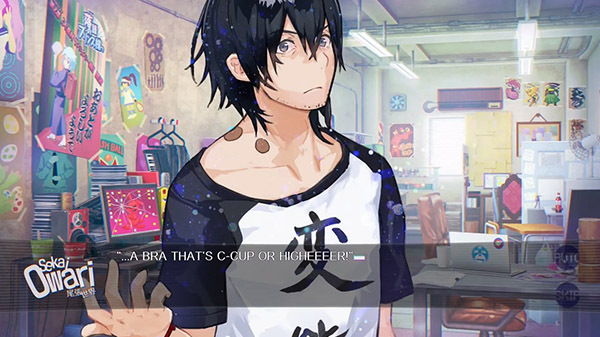 Publisher PQube and developer Red Entertainment have released a new trailer for the western release of Our World is Ended introducing the Judgement 7 team members that make up the main cast. Sekai Owari – The perverted programmer. Owari is the founder and main programmer of Judgement 7. Although he is supposed to be the representative of the team, the members do not respect him because of his perverted personality. He is in fact exceptionally skilled and able to create ultra perverted programs that can not be written by ordinary people. Asano Hayase – The unfortunate sound designer. Asano is Yuno’s older sister. She composes the music and sound effects of the games. Although she is a sound designer, she is quite deaf but she doesn’t know it yet. She is blessed with the ability to destroy PCs and the hardware in her reach – including her own synthesizer, but she doesn’t really care. Natsumi Yuki – The chaotic designer. Natsumi is the style designer who lives in the office of Judgement 7 and in charge of character designs, environments, UI, and logos of the games. She is strict with herself and everyone else and always takes work seriously, but drawing makes her happy. Tatiana Alexandrovna Sharapova – The childish programmer. Tatiana was born in Russia but she has lived in Japan since her childhood. She usually works as a programmer at research institutes while attending junior high school in Hokkaido. She is a super genius also known as “Russian’s Hidden Treasure” but apart from her programming skills, she is inferior to most of the children of her age. Her basic social and living skills are more around the lower elementary school or kindergarten level. Yuno Hayase – The airheaded assistant. Yuno is Asano’s little sister and currently a high school student. She works part-time at Judgement 7 as an assistant and does all kinds of work. Laid-back and often in a good mood, she also happens to be a good judge of character. Reiji Gozen – The plain part-time director. Reiji is a university student who dreams of becoming a game designer. He works part-time while attending university. As a relatively normal and social guy, he stands out among the other members of Judgement 7. Our World is Ended is due out for PlayStation 4 and Switch on April 18 in North America and Europe. The physical edition is due out in Europe on the same day, while it is not due out in North America until May 7. A PC version is due out via Steam in 2019.